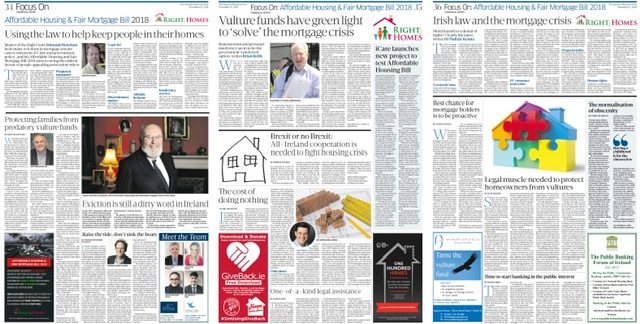 Right2Homes is pleased to present the articles which appeared in The Sunday Business Post on November 25, 2018. The authors, recognised social, legal, political, academic and sector authorities have expertise in every aspect of the #Housing and #Homeless crises both here in Ireland and abroad. All have generously contributed articles at our request. Constraints of space did require that some pieces were edited. The following pages provide copies of the articles as they appeared – and where available, the original material submitted. Once again we would like to thank all the supporters of Right2Homes and our efforts to see that wherever possible – we can avoid eviction and keep people in their homes. Dr. Padraic Kenna – Irish law and the mortgage crisis; Moral hazard or a denial of rights? Clearly the latter.